THE LOVE BUG SOLUTION™ for Commercial Use, Fleet Owners | Best Bug Cleaner, Remover and Protector all in one! Lovebug film barrier, bugs rinse off, no scrubbing! - The Love Bug Solution - Best Lovebug Cleaner, Easiest Lovebug Remover - Protects Vehicles from Love Bug Damage! Works for all bugs including love bugs! 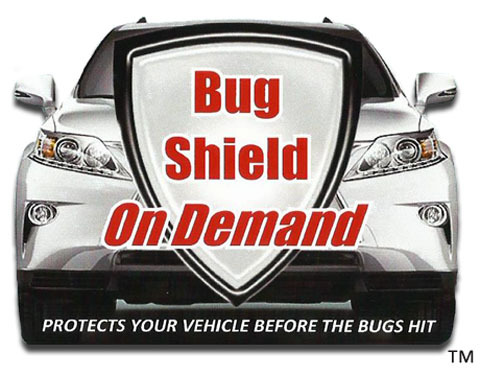 Bug Shield On Demand™ - Perfect for Fleet Vehicle Owners! Bug Shield On Demand™ is now offered in 1 gallon containers and 5 gallon jerrycans. Application of the commercial product is done via spray gun and compressor. Bug Shield On Demand™ commercial product line is an all in one solution! Protects vehicles from bug damage: spray on barrier protects vehicle paint and chrome from bug damage. Love Bug Remover: the easiest love bug remover on the market! Works for all bugs! Love Bug Cleaner: when water is applied, Bug Shield On Demand™ suds up and turns into the ultimate bug cleaner. Just hose bugs off! Developed to provide the ultimate in love bug removal and love bug cleaner product all in one and the only product that protects your vehicle's paint from love bug damage. The video below demonstrates the water-soluble, cellophane-like barrier known as Bug Shield On Demand™. Bugs stick to the barrier not the vehicle! To remove bugs, just wash vehicle as normal and bugs wash right off with the solution. Bug Shield On Demand™ is currently available ONLY at a limited number of full service car and truck wash and retail stores locations in Florida, Texas, Mississippi, Alabama, Louisiana, Georgia, and South Carolina. Dealer Distribution opportunities are available worldwide! Visit ﻿Bug Shield On Demand™ Dealer Distribution to obtain information on how you can supply your customers with Bug Shield On Demand™. Works on ALL BUGS all over the world including love bugs!